Yay!! Fall is almost here, and I once more feel comfortable having a towel on my lap so that I can work happily on bead embroidery projects. Only a few small ones to start back up, so that I (and you) can have some instant gratification! 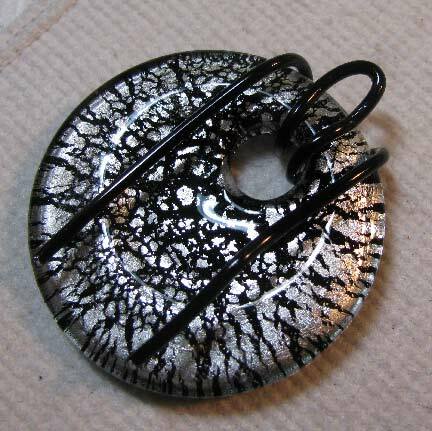 I have had this pretty glass donut for quite some time. It came from Auntie's Beads, and it was given to me along with several others, some to create projects with and some to give away. I always knew that this one was destined for better things than just hanging on a string! 1. I started with a heavy gauge (12) piece of wire, bent it in half, and looped it through the top of the donut hole as shown. 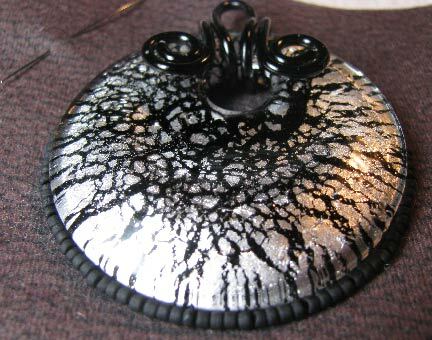 My wire is about 6 inches long, but you will have to experiment to see what works best with the piece you have. 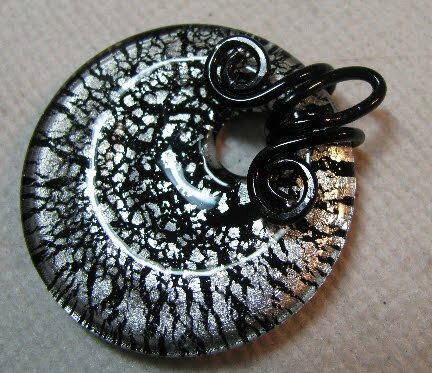 You can use this wrap even if the hole in your piece is dead center...just make the wire longer. 2. Curl the long ends into a spiral on each side, lying flat against the donut. 3. I used some double-sided tape (or you can use glue) to lightly adhere my donut to a foundation fabric. You can't see it, but I've taken several stitches to tack the wires down to the fabric as well, where they cross the back of the donut. Just a little added insurance. 4. Add a back stitched row of size 11/0 seed beads around the base of the donut. I like to work in fours, but you can use any count you like as long as you end up with an even number of beads total. If you need some instructions for back stitch and/or would like additional information on choosing fabrics, threads, etc, please download a free copy of the first chapter of my e-book, Every Bead Has a Story! 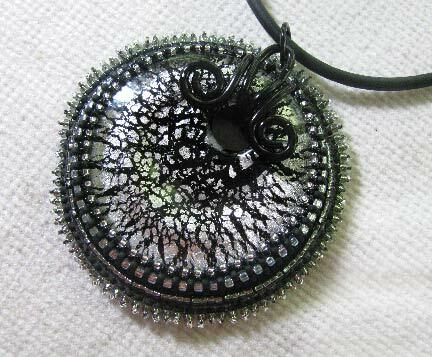 Next week, I'll show you how to complete the bead stitched bezel and finish off the pendant in Part Two. As regards FTC disclosure guidelines: I have received this glass donut free of charge from Auntie's Beads in order to create a project free of charge for you. I have not been paid for my endorsement as it pertains to the products received.